Two Sarabandes for Piano, Two Gavottes for Piano, Two Gigues for Piano, Transcription of a Gavotte by Gluck, Study after an Impromptu by Schubert Op.90 No.2, Theme and Variations in D minor. Alvanis follows his earlier CD containing the first ten Hungarian Dances (plus Studies and Rhapsodies) with this recording of the less well known examples from Books 3 and 4. I haven’t had a chance to consult the New Grove but I am not entirely convinced that the transcriptions for solo piano are the work of Brahms himself, unlike the formidably difficult versions of numbers 1 to 10. The list of works I consulted was somewhat ambiguous. The more familiar Books 1 and 2 have been the subject of solo recordings from Kissin and Budiardjo within the last couple of years but, as far as I know, the later sets have received scant attention in the two-hand versions. Whether or not Alvanis made his own transcriptions, it matters little for these are fine accounts of music that deserves to be better known. Of course, four-hand players will know them well already, and may feel that the original form is good enough, not to mention the orchestral versions. This CD has something of the air of a completist’s edition about it. 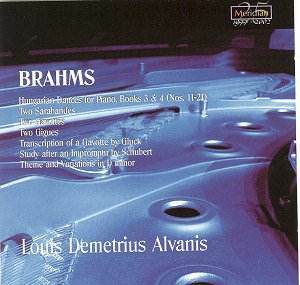 The sarabandes, gavottes for piano and gigues are all student works composed when Brahms was studying the music of J.S. Bach; as such, they are skilful exercises, worth hearing but hardly for repeated listening. The study on Schubert’s E flat impromptu reminds us how important was Brahms’ contribution to the catalogue of musically worthwhile study material, although, musically speaking, there is no way I would prefer to listen to this version rather than Schubert’s. The ‘Gluck Gavotte’ is much more memorable, while the Variations in D minor is a serious, truly ‘Brahmsian’ work, though again, I would always prefer to hear the far greater diversity of his Variations on a Theme of Handel. All the music is well played and worth having for the Hungarian Dances and the D minor Variations. The student material may be useful for those who want to see how Brahms somehow integrated Baroque instincts into a Romantic context.